Sarah Hyland flashed significant sideboob in a not-so-basic black dress at the Critics' Choice Awards in Santa Monica on Sunday. 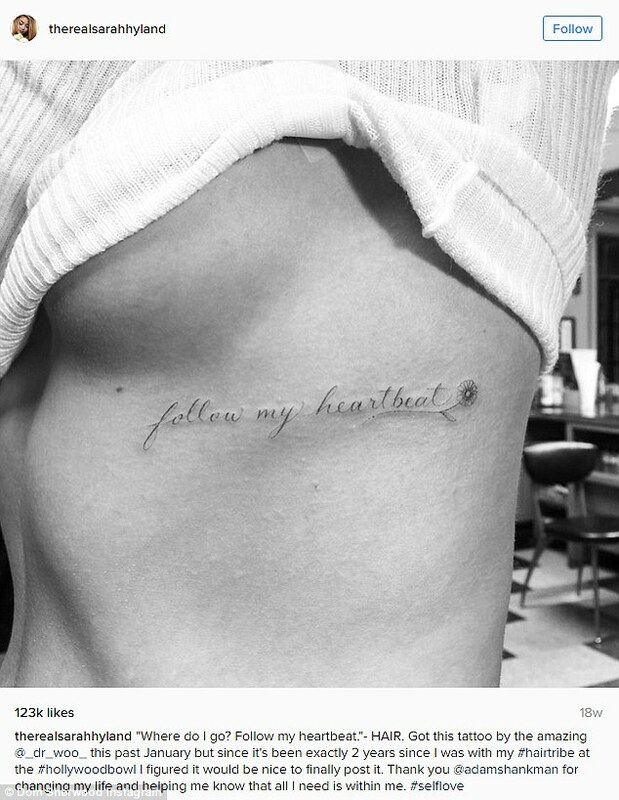 The 26-year-old actress also flaunted the floral 'follow my heartbeat' rib tattoo she got back on January 17 from the Shamrock Social Club's artist Dr. Woo. The native New Yorker's inked lyric from Hair's Where Do I Go stems back to Adam Shankman 'changing her life' after she played Crissy in the 2014 Hollywood Bowl production. 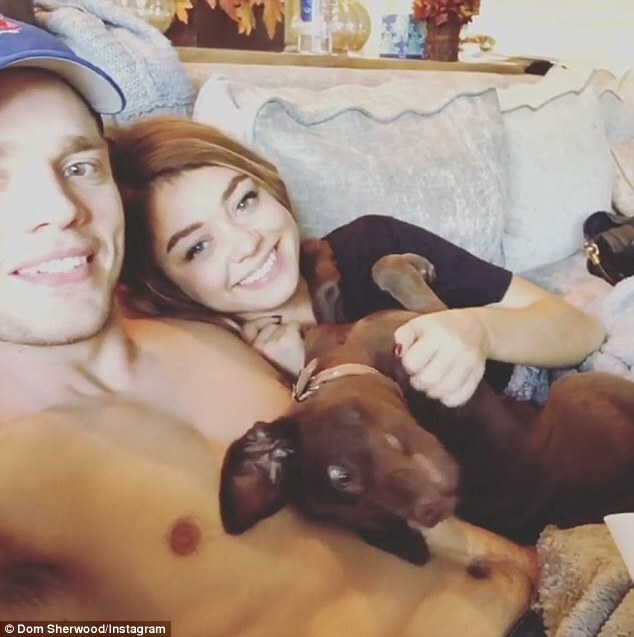 Hyland also has a hummingbird tatt behind her ear and matching arrows with her boyfriend of nearly two years, Dominic Sherwood. The 26-year-old Englishman - who apparently skipped the A&E-broadcast ceremony - plays Jace Wayland on Freeform's Shadowhunters. As she posed on the blue carpet, Sarah paired her plunging full-skirted frock with an ebony amulet and matching stilettos selected by stylist Brad Goreski. The doe-eyed starlet had her ombré bob curls coiffed by Ryan Richman and her minimal make-up applied by Allan Avendaño. Hyland was joined at Barker Hangar by her Modern Family castmates Eric Stonestreet, Nolan Gould, and Ariel Winter. Not only was their ABC sitcom nominated for best comedy series, Sarah's onscreen parents Ty Burrell and Julie Bowen were both up for the best supporting trophies. 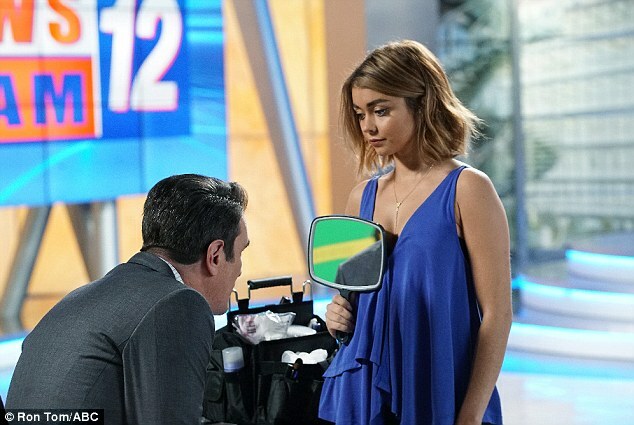 Catch more of the four-time SAG Award winner as Haley Dunphy in the eighth season of Modern Family, which returns this Wednesday on ABC. Sunday also marked the debut of the XOXO actress' Nickelodeon special Lip Sync Battle Shorties she hosted, which will also air Wednesday on Spike. Bill Hader – Documentary Now!